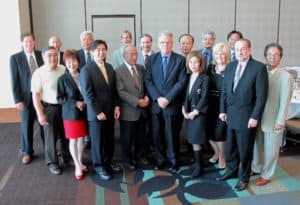 On June 6th, 2013, the Canada-Japan Society of British Columbia, the Japanese Business Association of Vancouver and the Japan-Canada Chamber of Commerce co-hosted a Luncheon, welcoming the newly appointed Ambassador of Canada to Japan, Mackenzie Clugston. The event was a great success thanks to the participation of our members, as well the support by other Japanese-Canadian Organization including Kiyukai, Mokuyokai, Kenyukai, Cosmos Seminar, Tonarigumi and Ofukai, along with Tomoe Arts and Vancouver Symphony Orchestra. Discussed were subjects from investments in the energy sector, advancements in gaming and IT, growth in tourism and education and how these combined effects continue to improve the relationship between BC and Japan and how BC continues to show positive movement in business and employment. Thank you everybody for your support. Photo courtesy of Seo Midori, Nikka Times.